(Metric and US units) This program provides Psychrometric properties of air given two properties as input values at a known altitude (or atmospheric pressure). The properties are determined using the ideal gas law for the behavior of air. Once the properties are determined, the point is indicated on the Psychrometric chart. Process lines can be connected between any two know points, this will provide the user with the differences in moving from one point to the next. 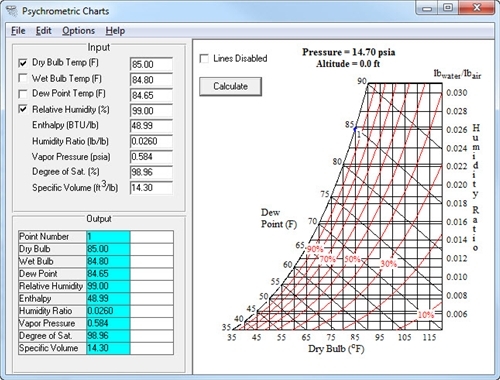 Additionally, this program will allow the user to perform some basic HVAC calculations that depend on psychrometrics.